A few weeks ago I saw some discounted ripe bananas at the grocery and I knew they were destined for greatness. In front of the overripe banana display, I had a vision of creamy loveliness, enrobed in hot fudge sauce, draped with sticky caramel, fluffed with whipped cream and crowned with a fresh cherry. These bananas, on their last leg, were elected on the spot for Roasted Banana Ice Cream. Alas. Cherry harvest came. Payroll came. I had to wash my hair. I had to rearrange my sock drawer. I had to do anything and everything besides make ice cream. And then, this morning, underneath the pitch-black bananas, there was an oozing puddle of banana juice. Something had to be done, and quick. 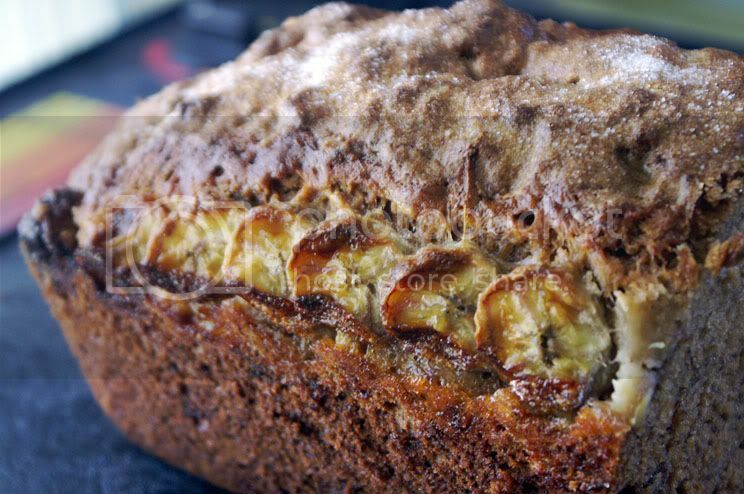 I'm sorry, but once an overripe banana has been chosen for something as exalted as Roasted Banana Ice Cream, I can't doom it to ordinary banana bread. So I scanned the blogosphere for a new and exciting recipe. As usual, Annie's Eats came through with another Cook's Illustrated recipe. Exhibit A: Caramelized banana slices framing the sides. Exhibit B: Domed perfection and tender crumb in the moist interior. Exhibit C: Butter's perfect companion. Slathered dripping melting soaking butter. Exhibit D: Crispy sugared crust, counterbalancing the rest of the chewy slice. But the taste? The taste? 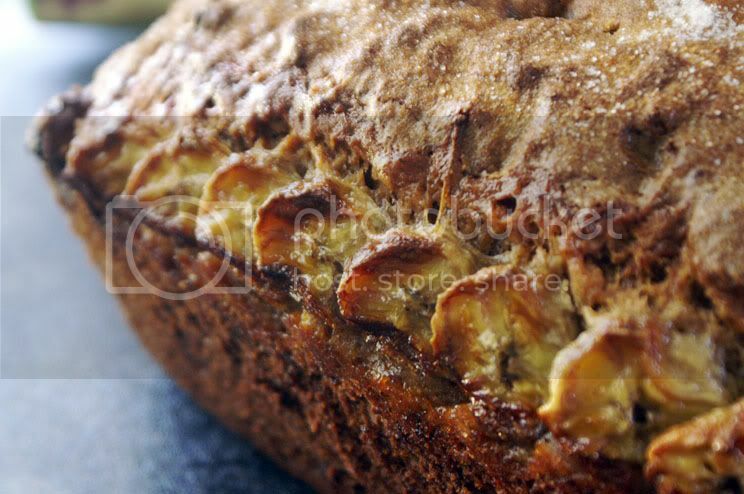 It's much more beautiful, much more intensely banana-y, and has a much nicer texture than "ordinary" banana bread, so I've entitled it "Banana Bread Deluxe." 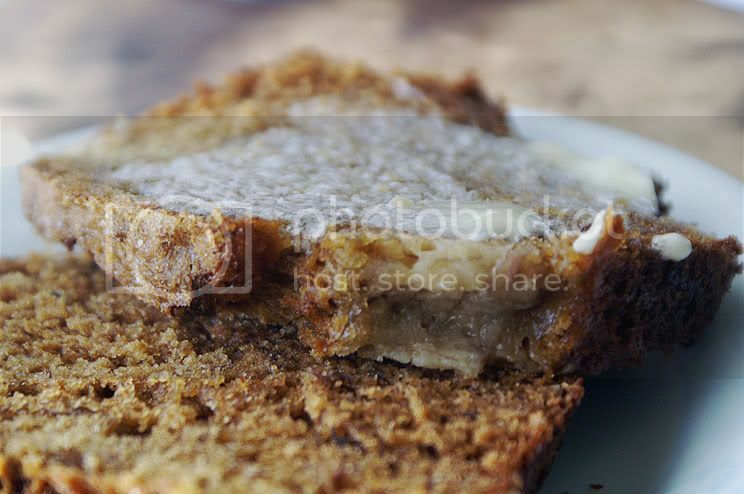 At the end of the day, however, it's still banana bread. This is the version I'll use for company because it does have an extra "oomph" that my usual recipe is missing. But while the two extra steps involved in this recipe kick it up a flavor notch, they also add a half hour or so worth of work (and a few extra dishes) to a normally "quick and easy" recipe. Perfect for company, frivolous for weekday breakfasts. Preheat the oven to 350˚ F. Lightly spray a loaf pan (about 9 x 5 inches) with cooking spray. In a medium bowl, combine the flour, baking soda and salt; whisk together and set aside. Transfer the reserved banana liquid to a medium saucepan over medium-high heat. Cook until reduced to about ¼ cup, 5-10 minutes. Remove the pan from the heat. In a large bowl, combine the bananas and the reduced banana liquid. Mash with a potato masher or whisk until fairly smooth. Whisk in the melted butter, eggs, brown sugar and vanilla. Add the dry ingredients to the bowl with the banana mixture. Fold together gently, just until all of the dry ingredients are incorporated. Pour the batter into the prepared pan and smooth with a spatula. Slice the remaining banana diagonally into ¼-inch thick slices. Layer the banana slices along both sides of the top of the batter, leaving a couple of inches in the center to allow an even rise. Sprinkle the sugar evenly over the assembled loaf. Wow, that looks divine! 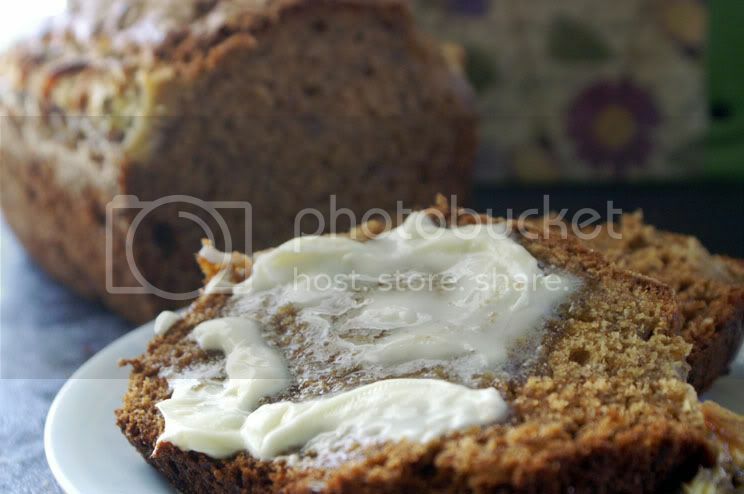 What a tasty recipe and fantastic photos, i can almost taste that melted butter! Thanks so much for this! 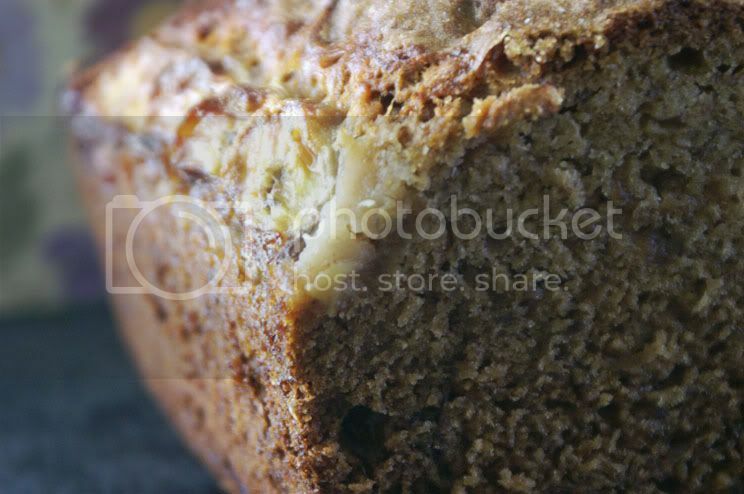 I am a huge banana bread lover, and make it VERY often. Between me being pregnant (and bananas for leg cramps), and a 10 month old eating them, I have to buy so many bananas at the grocery store in order to have enough to make banana bread when they are very ripe! I always stick to the same recipe, because I've never had it fail, but this looks like a recipe I'm ready to put forth a little more effort into to try. 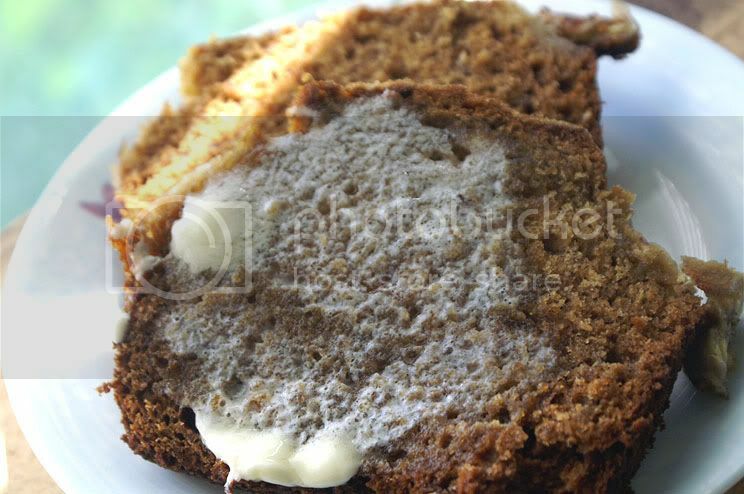 I'll be interested to see how moist it is - I try to throw sour cream or yogurt into my recipes like this to make it more moist, but maybe with the banana juice it helps a lot. Well, I think the calling card of this recipe is that it isn't quite as moist as most recipes which makes it hold up better on the second and third day (rather than getting soggy and gummy like a lot of other recipes do). I think the banana juice is mostly to intensify the banana flavor. So if you like a really moist banana bread, you might want to either cook it a little less, or perhaps add sour cream/yogurt :). It is! :) Thanks, Marie! That looks so good. I put chocolate chips in mine normally but this looks so sweet and juicy it doesnt seem to need it! It looks amazing, but at its core it still tastes like banana bread :). I think regular banana bread with bananas sliced on top might make the same presentation, but chocolate chips inside sound yummy!